ISS042E277376 (02/16/2015) — U.S. astronaut Barry “Butch” Wilmore checks out his spacesuit in preparation for an extravehicular activity (EVA) or spacewalk. Wilmore is the commander of Expedition 42 onboard the International Space Station. International Space Station managers met Friday morning and gave approval to proceed with U.S. EVA 31 on Sunday, March 1 as planned. The Mission Management Team reviewed the status of spacewalk preparations as well as an analysis of the minor seepage of water into the helmet of Expedition 42 Flight Engineer Terry Virts of NASA following the last spacewalk on Feb. 25 after he was back in the crew lock section of the Quest airlock and the repressurization of the airlock had begun. Spacewalk specialists reported that Virts’ suit — serial number 3005 — has a history of what is called “sublimator water carryover”, a small amount of residual water in the sublimator cooling component that can condense once the environment around the suit is repressurized following its exposure to vacuum during a spacewalk, resulting in a tiny amount of water pushing into the helmet. 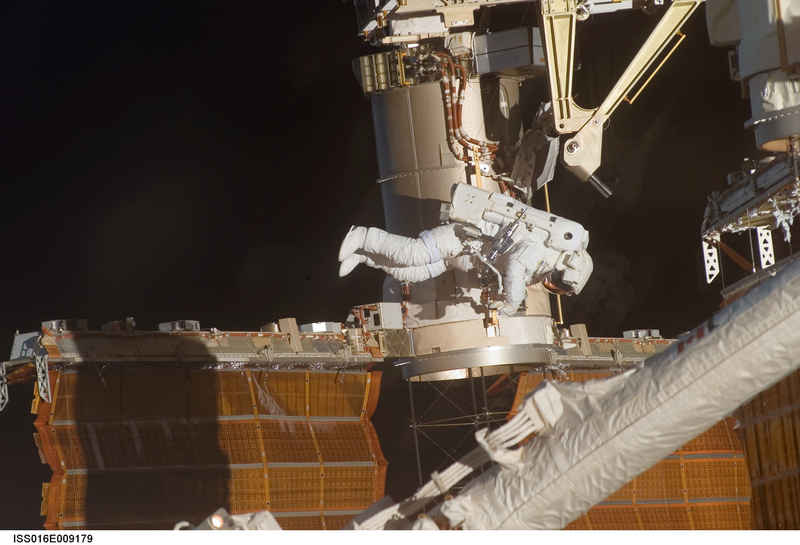 A high degree of confidence was expressed that the suit’s systems are all in good shape and approval was given to proceed with the third spacewalk in this series of EVAs. During Sunday’s spacewalk, Virts and Expedition 42 Commander Barry Wilmore will deploy 400 feet of cable along the truss of the station and install antennas as part of the new Common Communications for Visiting Vehicles (C2V2) system that will provide rendezvous and navigational data to visiting vehicles approaching the station, including the new U.S. commercial crew vehicles. It will be the 187th spacewalk in support of station assembly and maintenance, the fourth for Wilmore in his career and the third for Virts. Swapping designations for this final scheduled spacewalk for Expedition 42, Virts will be designated extravehicular crew member 1 (EV1) on Sunday and will wear the suit with the red stripes. Wilmore will be extravehicular crew member 2 (EV2) with no stripes on his suit. NASA Television coverage on Sunday will begin at 5 a.m. Central time. The spacewalk will begin around 6:10 a.m. Central time and is expected to last about 6 hours, 45 minutes. A docked ISS Progress 58 space freighter fired its engines Thursday morning to boost the International Space Station’s orbit by 1.3 statute miles. A second orbital reboost is scheduled March 3 before Expedition 42 undocks March 12 and lands in Kazakhstan. Expedition 43 will launch March 27 with the One Year Crew from the Baikonur Cosmodrome in Kazakhstan. NASA astronauts Barry Wilmore and Terry Virts are checking their tools and spacesuits after Wednesday’s fully successful spacewalk to route cables, grease the leading end effector of the Canadarm2 and prepare the station for the relocation of the Permanent Multipurpose Module and the new Bigelow Expandable Activity Module. They have one more spacewalk to go on Sunday to finish setting up the station for future U.S. commercial space vehicles. While Wilmore and Virts get ready for Sunday’s third and final spacewalk, mission managers will meet Friday morning to review preparations before deciding on a “go-no go” decision. NASA astronaut and spacewalker Terry Virts reported seeing a small amount of water floating free in his helmet during airlock repressurization at the conclusion of Wednesday’s spacewalk. There was no report of water during the spacewalk itself, and the crew was never in any danger. 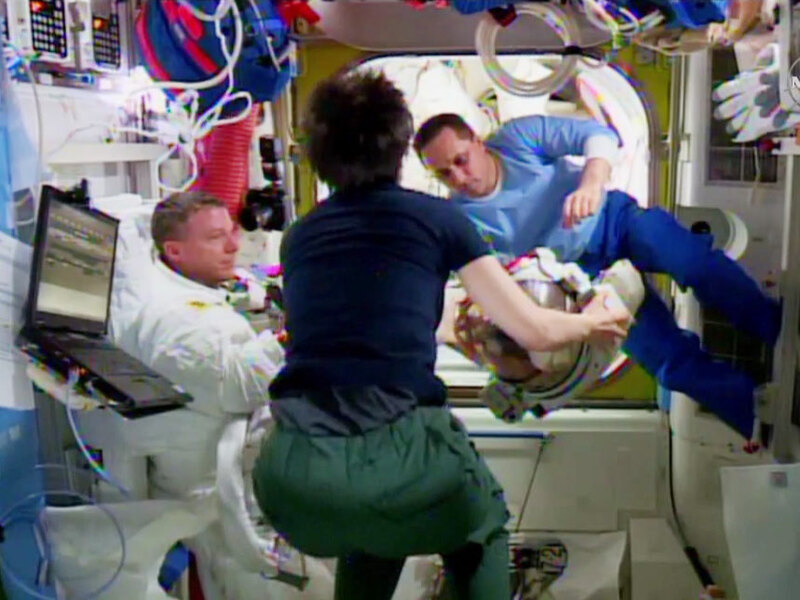 After removing the helmet, Expedition 42 crew member Samantha Cristoforetti reported on the free floating water inside the helmet and indicated the helmet absorption pad was damp. Ground teams are currently analyzing the situation to confirm the source of the water. Virts was wearing spacesuit #3005, which experienced a similar issue after a spacewalk in December 2013. The teams will carefully evaluate the spacesuit data and perform a detailed assessment prior to the next spacewalk. Virts and fellow spacewalker Barry Wilmore are scheduled to perform their third and final spacewalk on Sunday, March 1. 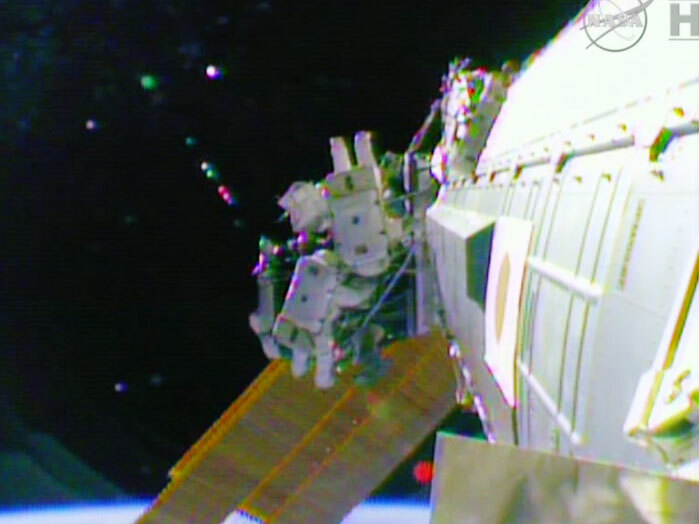 NASA astronauts Barry Wilmore and Terry Virts ended their spacewalk at 1:34 p.m. EST with the repressurization of the Quest airlock. Wilmore and Virts completed all the scheduled tasks for today. They completed rigging a series of power cables on Pressurized Mating Adapter-2, lubricated the Latching End Effecter of the space station’s Canadarm2 robotic arm, and prepared the Tranquility module for the station’s upcoming reconfiguration in preparation for the arrival of commercial crew vehicles later this decade. They also were able to complete get-ahead work for the installation during Sunday’s spacewalk of the Common Communications for Visiting Vehicles (C2V2) system by pre-staging wire-ties that will be used to secure some 400 feet of cable. 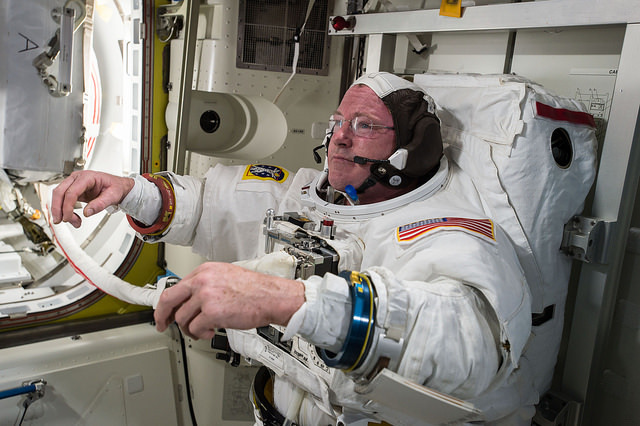 The 6-hour, 43-minute spacewalk was the third for Wilmore and the second for Virts. Wilmore now has spent 19 hours and 58 minutes in the void of space during his three spacewalks. Virts has now spent 13 hours and 24 minutes outside during his two excursions. Crews have now spent a total of 1,165 hours and 51 minutes conducting space station assembly and maintenance during 186 spacewalks. The duo will venture outside the space station again on Sunday, March 1, to install the C2V2 equipment commercial spacecraft delivering crews to the space station will use to rendezvous and dock with the orbital laboratory. NASA TV coverage will begin at 6 a.m. Sunday ahead of a planned 7:10 a.m. start time for the spacewalk. ISS042E283139 (02/21/2015) — NASA astronaut Terry, Virts Flight Engineer of Expedition 42 is seen working to complete a cable routing task while near the forward facing port of the Harmony module on the International Space Station. NASA astronauts Barry Wilmore and Terry Virts switched their spacesuits to battery power at 6:51 a.m. EST, signifying the start of today’s planned 6-hour, 30-minute spacewalk. Wilmore is wearing a spacesuit with red stripes and is designated EV1. His helmet camera displays the number 18. Virts is wearing a spacesuit with no stripes and is designated EV2. His helmet camera displays the number 20. This is third spacewalk for Wilmore and the second for Virts. Wilmore and Virts will finish routing a series of cables in preparation for the arrival of two International Docking Adapters later this year. Boeing built the two new docking adapters, and they will be delivered to the station on a pair of SpaceX Dragon cargo spacecraft this year. Boeing’s Crew Space Transportation (CST)-100 and SpaceX’s Crew Dragon will use the adapters to deliver astronauts to the space station later this decade. Virts also will lubricate elements at the latching end of the space station’s robotic arm while Wilmore prepares the Tranquility module for the relocation of the Permanent Multipurpose Module and the arrival of the Bigelow Expandable Activity Module (BEAM) later this year. Once BEAM arrives to the space station, crew members and ground-based engineers will gather performance data during a two-year test period to evaluate expandable space habitat technology. NASA Television is broadcasting the spacewalk at https://www.nasa.gov/nasatv. ISS016-E-009179 (3 Nov. 2007) — Astronaut Doug Wheelock, STS-120 mission specialist, participates in a spacewalk while Space Shuttle Discovery is docked with the International Space Station. NASA Television will provide live coverage of today’s U.S. spacewalk conducted from the International Space Station beginning at 6 a.m. EST. The spacewalk is scheduled to begin at 7:10 a.m. and run about 6-1/2 hours. Expedition 42 Commander Barry Wilmore and Flight Engineer Terry Virts will venture outside the orbital complex for the second of three spacewalks to prepare cables for new docking ports that will allow future crews launching from Florida on U.S. commercial spacecraft to dock to the space station. They also will make other preparations for a reconfiguration of the space station in advance of the arrival of private crewed spacecraft. Wilmore is wearing a spacesuit with red stripes and is designated EV1. His helmet camera displays the number 18. Virts is wearing a spacesuit with no stripes and is designated EV2. His helmet camera displays the number 20. 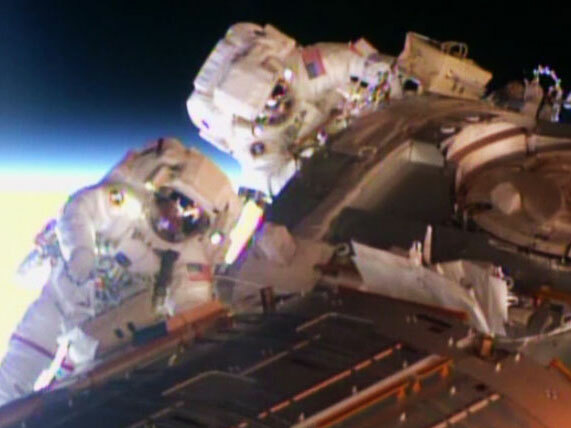 During a spacewalk on Saturday, Feb. 21, the duo spent 6 hours, 41 minutes outside deploying eight bundles of cables. Tomorrow they will route two additional bundles, lubricate parts of the Latching End Effector of the space station’s robotic arm and prepare the Tranquility module for the relocation later this year of the Permanent Multipurpose Module and the arrival of the Bigelow Expandable Activity Module, an expandable space habitat technology. Watch the spacewalk live on NASA Television or at https://www.nasa.gov/nasatv. Also, astronaut and veteran spacewalker Doug Wheelock will answer your questions on social media from Mission Control Center at Johnson Space Center today. Use the hashtag #AskNASA and Wheelock will begin answering questions at 9 a.m. 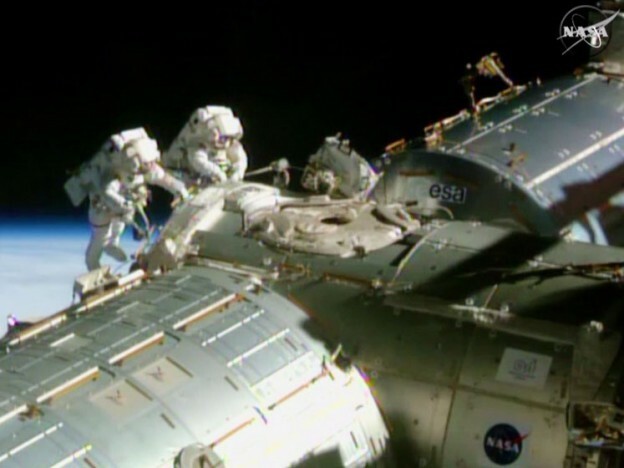 This is the 186th spacewalk in support of space station assembly and maintenance. 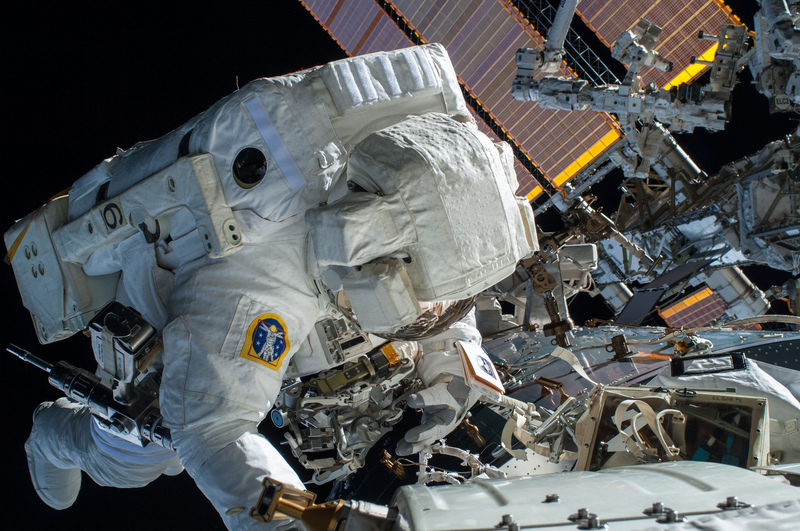 Join the conversation on Twitter by following @NASA, @Space_Station, and the hashtag #spacewalk. To learn more about all the ways to connect and collaborate with NASA, visit: https://www.nasa.gov/connect. ISS042E283176 (02/21/2015) — NASA astronaut Barry “Butch” Wilmore, Commander of Expedition 42 on Feb, 21, 2015 is caught by the camera as the Earth’s surface passes by in the background. A pair of spacewalkers are conducting final reviews as they get ready for Wednesday morning’s spacewalk scheduled to start at 7:10 a.m. EST. They will be assisted by Italian astronaut Samantha Cristoforetti who will be the spacewalk choreographer and robotic arm operator. NASA astronauts Barry Wilmore and Terry Virts will go outside for more cable routing work and lubrication work on the Canadarm2. 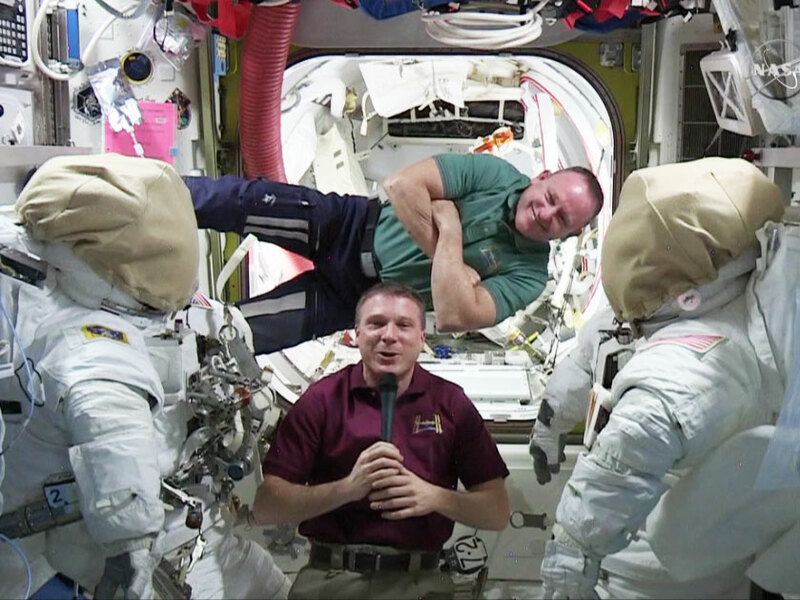 This will be the second in a series of three spacewalks meant to ready the International Space Station for a pair of International Docking Adapters. The third will be Sunday morning. The duo will also prepare the Tranquility module for the relocation of the Permanent Multipurpose Module. They are also readying the station for the new Bigelow Expandable Activity Module set to arrive later this year. The three cosmonauts focused on maintenance tasks and their set of microgravity science to benefit life on Earth and future crews. Cristoforetti also worked on maintenance and science work in between her spacewalk preparations. 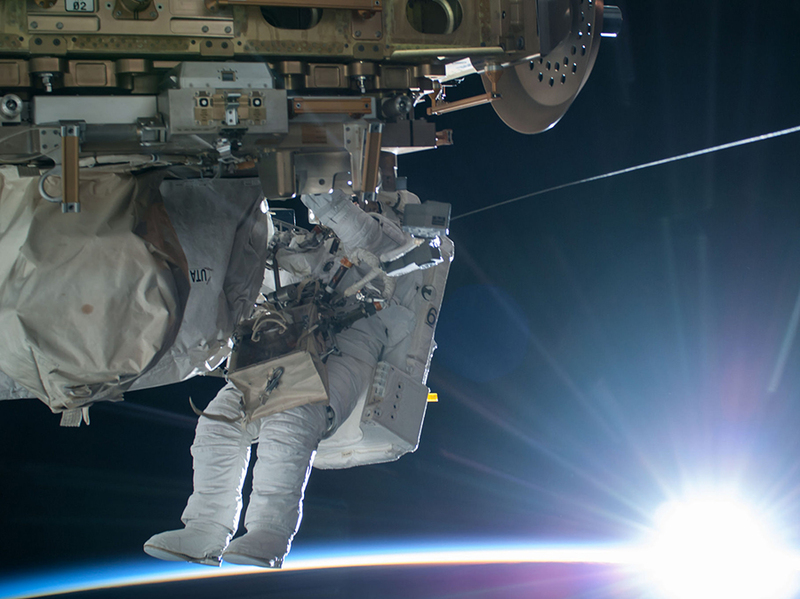 ISS042E283203 (02/21/2015) — NASA astronaut Terry Virts Flight Engineer of Expedition 42 on the International Space Station is seen working to complete a cable routing task while the sun begins to peak over the Earth’s horizon on Feb. 21 2015. Ground controllers have maneuvered the space station’s large robotic arm Canadarm2 in place for work planned for Wednesday’s spacewalk. Spacewalkers Barry Wilmore and Terry Virts will start their second spacewalk at 7:10 a.m. EST to lay more cables and lubricate one of Canadarm2’s two latching end effectors, which serve as tip or base for the robotic arm. They will also prepare the Tranquility module for the relocation of the Permanent Multipurpose Module and the new Bigelow Expanded Activity Module later this year. While the duo is reviewing its procedures and getting its tools and spacesuits ready, Italian astronaut Samantha Cristoforetti worked a variety of advanced life science and high-flying plumbing work. She wore gear for the Drain Brain experiment that studies how blood flows from the brain back to the heart in microgravity. The three Expedition 42 cosmonauts enjoyed an off-duty day today in observation of the Russian Defender of the Fatherland holiday. NASA astronauts Barry Wilmore and Terry Virts ended their spacewalk at 2:26 p.m. EST with the repressurization of the Quest airlock. Wilmore and Virts completed all the scheduled tasks for today and one get ahead task. They rigged a series of power and data cables at the forward end of the Harmony module and Pressurized Mating Adapter-2 and routed 340 of 360 feet of cable. The cable routing work is part of a reconfiguration of station systems and modules to accommodate the delivery of new docking adapters that commercial crew vehicles will use later this decade to deliver astronauts to the orbital laboratory. 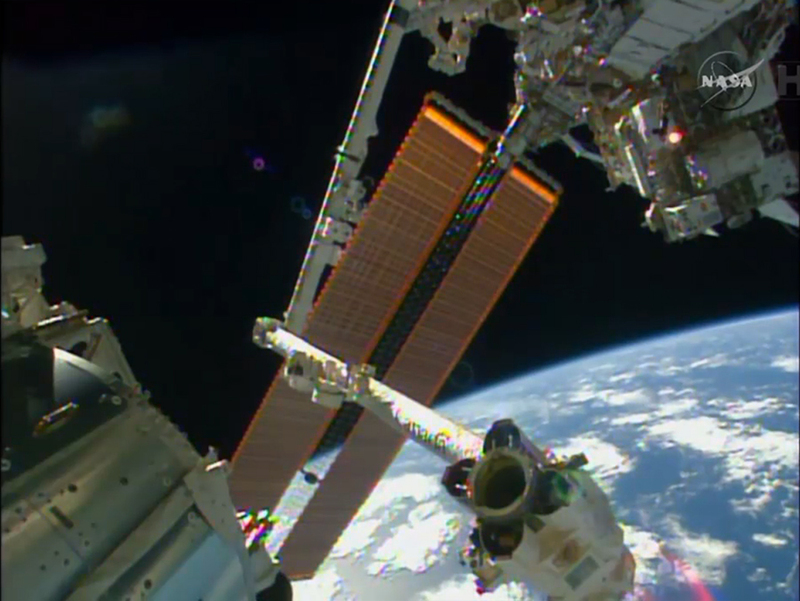 The 6-hour, 41-minute spacewalk was the first for Virts. Wilmore now has spent 13 hours and 15 minutes in the void of space during two spacewalks. 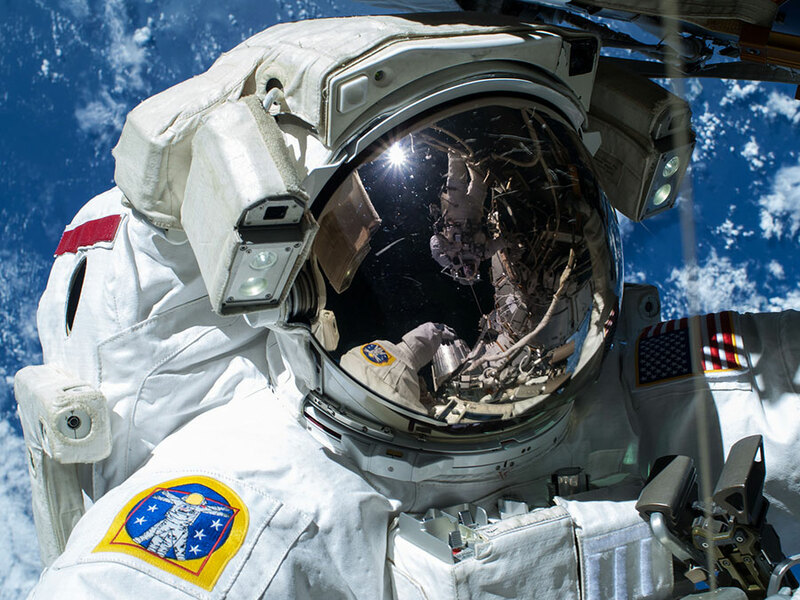 The spacewalk began this morning at 7:45 a.m. Astronauts have now spent a total of 1,159 hours and 8 minutes conducting space station assembly and maintenance during 185 spacewalks. The duo will venture outside the space station again on Wednesday, Feb. 25, to deploy two more cables and lubricate the end of the space station’s robotic arm. NASA TV coverage will begin at 6 a.m. Wednesday ahead of a planned 7:10 a.m. start time for the spacewalk. Approximately 2 hours and 30 minutes into today’s spacewalk, astronauts Barry Wilmore and Terry Virts have finished attaching several new cables on the port side of Pressurized Mating Adapter-2. The duo will reinstall a debris shield before moving to attach another new cable on the starboard side and route additional cables during their remaining time outside the International Space Station. The crew is routing more than 300 feet of cable during today’s spacewalk and a second one planned for Wednesday as part of a reconfiguration of the station to enable U.S. commercial crew vehicles under development to dock to the space station in the coming years.